Burgers are an American dietary and cultural staple, in fact according to a recent omnibus survey conducted on behalf of Jennie-O Turkey Store, 31 percent of Americans identified the Burger as the American icon they could not do without, beating out rock n’ roll (28 percent) and baseball (14 percent). The survey also found that if Americans could change one thing about the burger, 40 percent would choose to make it “better for you” and Jennie-O Turkey Store is helping them do that beginning with a one-day-only “turkey store” in El Monte, Calif., just outside of Los Angeles, on Sept. 2, marking the launch of a mission to get Americans to choose turkey. Jennie-O Turkey Store will be serving up complimentary turkey burgers that have 10 fewer grams of fat and 100 fewer calories than those made with a typical beef patty as per USDA data (Comparison : USDA Data for Beef, Ground, 80% Lean Meat / 20% Fat, Raw). It all starts on Thursday, September 2 from 11 a.m. until 3 p.m. PST at 11655 Valley Blvd. in El Monte, Calif.
With a goal of serving 5,000 turkey burgers, Jennie-O Turkey Store aims to save Los Angeles residents 50,000 grams of fat and 500,000 calories in just four hours. 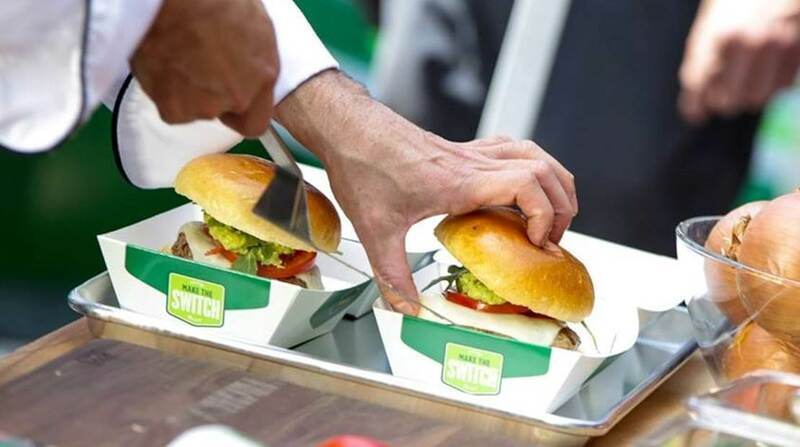 During this one-day event, Jennie-O Turkey Store will film consumer reactions to the turkey burgers for a national ad campaign, launching Sept. 20, that will challenge consumers to “switch”. Though more (44 percent) Americans dine out for their favorite burger, nearly 40 percent of Americans say they make their favorite burger at home. Jennie-O Turkey Store® products enable people to prepare their preferred burger in a way that is as lean as it is delicious. Jennie-O Turkey Store® products provide endless burger possibilities with 95/5 All Natural White Turkey Burgers, All Natural Quarter Pound Turkey Burgers, Fresh White Tray Turkey Patties, Savory-Seasoned Turkey Burgers, 93/7 Lean Turkey Burger Patties, 93/7 Lean Seasoned Turkey Burger Patties and their many fresh, ground turkey products. For additional information on Jennie-O Turkey Store and their new Make The Switch™ campaign, visit www.JennieO.com. The online omnibus study was conducted by Opinion Research Corporation among a sample of 1,061 adults comprising 516 men and 545 women 18 years of age and older. Interviewing for this survey was completed on August 26-27, 2010. Significance testing is done to the 95 percent confidence level. Hormel Foods Adds Canadian Bacon To Breakfast Meats Portfolio Hormel Foods introduces of the healthier and lower sodium Hormel Breakfast Canadian Bacon. About Jennie-O Turkey Store, Inc.
Jennie-O Turkey Store, Inc., based in Willmar, Minn., is a wholly owned subsidiary of Hormel Foods Corporation (NYSE:HRL) and one of the largest turkey processors and marketers in the world. Jennie-O Foods, Inc., acquired by Hormel Foods in 1986, was united with The Turkey Store Company in 2001 to create the industry-leading processor and marketer of traditional and value-added turkey products for the retail, foodservice and deli markets. Offering an array of high quality fresh, frozen, refrigerated and deli turkey products, Jennie-O Turkey Store produces more than 1,300 items, distributing its products throughout the United States and 26 countries. With corporate offices in Willmar, Jennie-O Turkey Store currently employs 7,000 people throughout the United States. For additional information, visit the Jennie-O Turkey Store Web site at www.jennieo.com.